Chef coats are the uniform of professional chefs worldwide. The chef coat isn't just the emblem of a professional in the food service industry. It serves an important function, too. As soon as you hear the word chef, an image comes to mind. It may be the gray mustachioed man on the Chef Boyardee can (who was a real Italian chef) or one of your favorite television chefs from the Food Network or Top Chef. The traditional hat or toque, a white double breasted jacket and checked or modern trousers and sensible shoes are the uniform of the professional chef. This uniform doesn't just look splendid. It serves a useful and functional purpose too. Traditional chef coats are white. They are double breasted, meaning that they have two rows of buttons down the front. Before the ease of modern laundry and washing machines, double breasted coats served a practical function. After the splatters and stains of cooking a multi-course gourmet meal, the chef could unbutton his coat and reverse it to hide the stains before appearing before madam or monsieur to receive compliments on his meal. It kept his appearance neat and clean when making messy dishes, gravies, and foods that stain easily such as a Balsamic vinegar reduction, or tomato sauce. Chef coats are also traditionally made of a heavy-duty cotton. They are generally created using two layers of cotton. While at first this extra insulation sounds counter intuitive, it's actually a safety precaution. You would think that it would make the sweltering heat of the kitchen unbearable. However, the double layer of cloth actually protects against burns from steam, ovens, or spilled hot liquids. Even the buttons on a traditional chef coat serve a functional purpose. The double-knotted cloth buttons actually withstand frequent washing better than plastic, metal or in olden times, horn or bone buttons. An authentic chef's uniform includes cloth buttons. The neckerchief tucked into the chef's jacket once served a functional purpose too. Before air conditioned kitchens, the intense heat from ovens and stoves meant that chefs perspired heavily. The neckerchief kept sweat from dripping off the chef by collecting it at the neckline. The chef could also untie the kerchief and use it to wipe his brow. Modern chefs wear black trousers, jeans, or comfortable pants, but the true chef's uniform includes checkered trousers. This loud pattern doesn't just distinguish a professional chef from lesser mortals in the kitchen. It's a clever way to hide all sorts of stains and spills. The chef's hat or toque, like many uniform hats or caps, also told others the rank of the chef. A long time ago, the head chef's hat was the tallest, while junior or under chefs had smaller, less noticeable caps. Caps keep hair from falling into food. Today, many modern chefs eschew the traditional white jacket, tall white hat, checkered pants and neckerchief. Chef coats now come in a wild rainbow of colors and styles. Dark colors, light colors, and everything in between may be found. Many restaurants now embroider their logos or the chef's name onto the coat too. Whether you're searching for the traditional chef garb or your own signature look, here are sources of chef coats and other fashionable and functional food service attire. Happy Chef Uniforms offers many traditionally styled coats and jackets ranging from the white uniform to a wide spectrum of colors. The prices are reasonable too and start at just $7.95 for a chef jacket. Short sleeves and plastic button jackets are also available, so you can choose what works best for your job and lifestyle. Crooked Brook isn't a uniform supply company. Rather, they offer artistic jackets suitable for chefs or even to wear as a fashion statement. These are fashionable, hip and ultra cool chef jackets. 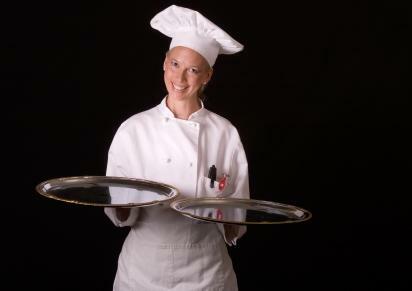 Chef Uniforms provides traditional chef coats at reasonable prices. Many have practical extras like small pockets tucked onto the sleeves to hold thermometers and extra big pockets to hold utensils. The Chefs Emporium features traditionally-styled chef uniforms from top to toe, including the loud striped, checked and other patterned pants sure to hide gravy stains. Whether you opt for the traditional, classic look or a more avant-garde style, remember to seek practicality first and aesthetic appeal second when searching for chef coats.